When you drive south from the Sea of Galilee and cross the Jordan River, you enter the Bet She'an Valley, home of many kibbutzim and moshavim. The Jordan River now forms the border between Israel and Jordan. The town of Bet She'an (pop. 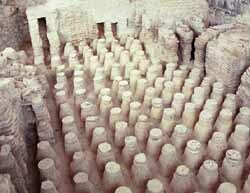 15,000) is the site of spectacular archaeological excavations and a rich history, dating back to biblical times. Bet She'an dates back to the Chalcolithic period (4th century BCE), when the town was an important stop for caravans and as a center of Egyptian rule. Excavations have uncovered a series of temples built by the Egyptians in honor of their local deities. Later, it became a Canaanite city, one which was not captured immediately by the Israelite conquest of Eretz Israel (Josh. 17:11, 16). However, it would eventually be alloted to the tribe of Manasseh (Josh. 17:11). It became an entirely Israelite city in the time of Solomon. It was at nearby Mt. Gilboa that King Saul was wounded in an epic battle with the Philistines in the 10th century B.C.E. Rather than allow himself to be captured by the victorious Philistines, Saul chose to fall on his sword. The Philistines then cut off his head and hung his body, and that of his sons on the city walls (I Samuel 31:9). Today, Bet She'an's main street is named after the King. Excavation in Bet She'an has uncovered the remains of a Canaanite city, a Hellenistic city (renamed Scythopolis) and a Roman Byzantine City. 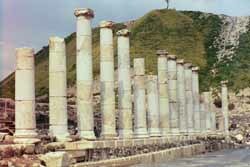 During its Hellenistic period, the city was the capital of the 10 Greek cities known collectively as teh Decapolis. The remains found in Bet She'an date back to the Hellenistic times. The city was predominantly Christian until the Arabs conquered it in the 7th century and restored its ancient name. The last Arab settlement of the town occurred with its conquest by the Egyptians in 1830. In September 1918, Bet She'an was captured by British forces. From the beginning of the 20th century, Jews, mainly from Musilim countries, resided in the city. Nevertheless during the 1936-39 Arab riots, the town became a headquarters for Arab guerillas attacking Jewish villages. In the War of Independence, Bet She'an fell to Israeli forces on May 12, 1948, who found it deserted by its inhabitants. The city was destroyed by a massive earthquake in 749 and archaeologists are still uncovering the remains of the ancient civilizations. Among the finds are a huge (1 1/2 acres) Byzantine bath house, a Roman temple and colonnaded streets paved with basalt stones. The most impressive of the ruins is the Roman Theater, which was built around the year 200. Built to accommodate roughly 8,000 people, the theater has a stone stage and was used for dramatic productions. An American tourist looking for coins with a metal detector near Kibbutz Tirat Tzvi discovered one of the only two bronze busts of the Roman emperor Hadrian. Outside of Bet She'an, beyond Mt. Gilboa, is Kibbutz Hefzibah, which has on its grounds the 6th century Beit Alpha synagogue. What makes this synagogue special is its beautifully preserved mosaic floor showing the 12 signs of the Zodiac with their names written in Hebrew and Aramaic. The floor was discovered by farmers while they were digging an irrigation ditch in 1928. Near Beit Alpha is Tel Amal (modern day Kibbutz Nir David), an exact replica of the first Stockade and Tower settlement, which was built on December 10, 1936. At the time, Jews were very worried about the vulnerability of their pioneer towns to Arab attacks and specially designed these fort-like structures to enhance their security. This became the model for 57 other settlements established between 1936-1939. The settlements were surrounded by a double wooden defense wall that was filled with cement, to withstand bullets. In this reconstructed settlement, you are able to see the tower and small living quarters of the inhabitants. And if you would like to see something completely different, nearby is Gan Garoo, a park devoted to the plants and animals of Australia. That's right, you can even find kangaroos in Israel! Located near Bet Shean is Kibbutz Ein Harod Meuchad. It was founded in 1921 by 35 young Israeli pioneers. Life on the Kibbutz began to grow exponentially following the British mandate, during the Third Aliyah (1919-1923). In 1953, the original kibbutz split into two distinct kibbbutzim, over ideological differences. Today the Kibbutz has over 500 members and a total population of nearly 1,000. There are several attractions within the kibbutz, including an art museum, a petting zoo, and a well known coffee shop. The art museum at Ein Harod, was the first building in Israel designed as a museum, built in 1948. The famous artist Chaim Atar, a kibbutz member, was one of the primary forces behind the establishment of this museum. The museum's permanent collection has over 10,000 items, with approximately 1,000 Judaica items. It is the largest museum in Northern Israel.